Yorkshire Shooting Academy Membership and Coverage. Membership is open to all UK shotgun and firearm holders, as well as sub 12ft lb air rifle owners (under 18’s must be accompanied by an adult member). If you have your own rifle, then great. If not you can still shoot, subject to being of sound mind and over 17 years of age. Please contact us for more information regarding younger people, other exemptions and relevant legislation. All applicants must have sporting public liability insurance with a limit of £10,000,000 indemnity. We can provide advice on membership of any of the respected sporting, shooting and fishing groups who include public liability insurance cover with their membership packages. Once approved by a member of staff, your YSA membership runs for 12 months from the 1st of April each year. Day events assisting our wildlife management team are also encouraged by members of staff , where we have several thousand acres of pest control & seasonal events, for members to practice there safe gun handling & rifle skills. Ysa welcome complete novices. Our training includes a short safety briefing along with some instruction.We really love teaching people who haven’t shot before, as they haven’t acquired any bad habits! Field experience is not essential. We offer guidance & tuition on our private approved grounds in W Yorkshire & N Yorkshire that is designed to assist our members in gaining a level of rifle & shotgun safety & field craft skills. Offering private single sessions that can also be arranged for the inexperienced shot who is new to any form of country sports and hunting activities, with gun use. Having reached the satisfactory level of safety & gun proficiency , marksmanship and also completing the probationary period of between 8 -12 visits, days out & assisting on field events on various quarry and game are offered to fully paid up Ysa members. A valid reason for a Uk / Eu shotgun and / or firearm. New FAC/ SGC approval is permitted after a probationary period which must be completed with an experienced Nra,Cpsa ,Dsc or Lantra, instructor or coach. 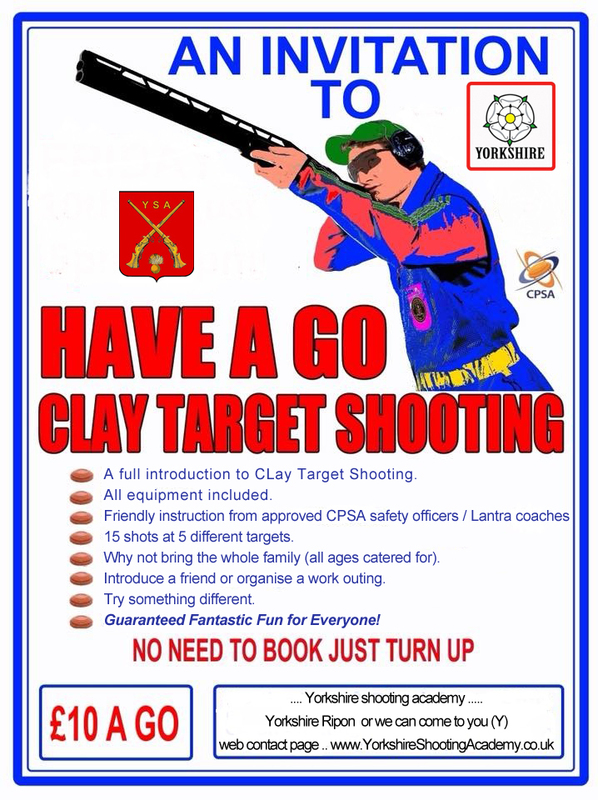 Regular access to our private grounds Nr Patley Bridge N Yorkshire (25 – 300 yards) full bore range, clay shooting facilities , with arranged camping and BBQ weekends , throughout the year for family & like minded friends via prior arrangement. Discount sporting insurance, (arranged ) with £10,000,000 liability and medical cover . Shooting as often as you wish (day or night), subject to approval, & Keep or sell all you shoot. Routine access to our private quarry areas (subject to availability) in: North , West Yorkshire & Lancashire. All subject to £35 * admin / A one off fee. Membership renewals * to be paid MIN 14 days prior to expiry, to qualify for £50 * Loyalty reward & Assured membership. With free seasonal events one per year (max 4 events ) stalking / seasonal birds etc . For membership enquiries please contact us.